Charles Webster Leadbeater (16 February 1854 - 1 March 1934) was an influential member of the Theosophical Society, author on occult subjects and co-initiator with J. I. Wedgwood of the Liberal Catholic Church. Originally a priest of the Church of England, his interest in spiritualism caused him to end his affiliation with Anglicanism in favour of the Theosophical Society, where he became an associate of Annie Besant. He became a high-ranking officer of the society. 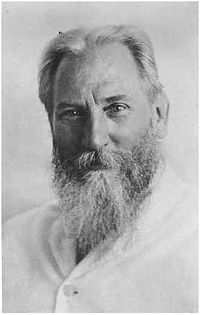 In 1884 he moved to Adyar, the headquarters of the Theosophical Society near Madras, India. He devoted himself to the cause of Theosophy and the related Liberal Catholic Church for the rest of his life. His talents as a prolific author on occultism kept him an important presence in Theosophy until his death in 1934. According to Gregory Tillett, "The range of his [C.W. Leadbeater's] . . . writings, and the wealth of material that flowed from his prolific pen, was vast. Some forty volumes, even more pamphlets, and for much of his life probably five or six journal articles a week . . . constituted his literary output . . . . The modern occult revival owes more to him than to anyone else; his concepts and ideas, his popularizing of occult and Theosophical terms and principles, run through all modern works on these subjects." However Leadbeater was a controversial figure. Is he the world's greatest occultist and psychic? Or the worst sort of charlatan and con-man? These widely ranging views of Charles Leadbeater were current in his lifetime and even now, years after his death in 1934, he remains a controversial figure. His disciples hailed him as the greatest seer of their age; his enemies attacked him as a fraud or worse. But as Gregory Tillett shows in this biography of Leadbeater, he has exerted great influence on modern ideas about the occult. This volume covers: scenery, inhabitants, and phenomena of the astral realm. It can be a most useful and practical guide book. you find more real facts on black magicians, elementals, shades, vampires, and werewolves.One of the best books to get the basic's of clairvoyance and astral projection. Click below to download the free ebook The Astral Plane: Its Scenery, Inhabitants and Phenomena by Leadbeater in PDF form. Werewolf--The Black Magician after Death. II. Non-human:--The Elemental Essence--The Kamarupas of Animals--Various Classes of Nature-Spirits, commonly called Fairies--Kamadevas--Rupadevas--Arupadevas--The Devarajahs. It was one of the first books by C. W.Leadbeater. The author writes about his own experiences in the physical and astral plane. The book shows that it is possible for anyone to acquire clairvoyance ability. Click below to download the free ebook Clairvoyance by Leadbeater in PDF form.